This LED floor lamp features a streamlined artful look created in anodized silver finish aluminum to instantly upgrade any room in the home. Add this beautiful LED floor lamp to any room in the home for a sleek and artful style upgrade. Created in silver finish aluminum, this minimalist floor lamp complements any color scheme from monochromatic to bold. An adjustable neck makes it easy to direct light exactly where it's needed. 48" high. Base is 9" wide. 10 watt built-in LED module has a light output comparable to a 60 watt incandescent bulb. 750 lumens. 3000K color temperature. 80 CRI. Dimmer switch on the column. 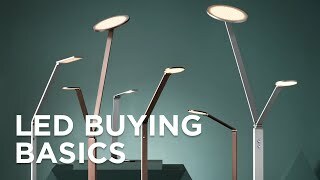 Tir Mono Disc modern LED floor lamp by Elk Lighting. Anodized aluminum finish. Anodized silver metal shade. Aluminum construction. Is the switch to turn the lamp on/off on the top or bottom of the lamp? BEST ANSWER: The dimmer switch is located toward the top of the vertical stem.